Abstract: The study of transverse resistance of superconductors is essential to understand the transition to superconductivity. Here, we investigated the in-plane transverse resistance of Ba0.5K0.5Fe2As2 superconductors, based on ultra-thin micro-bridges fabricated from optimally doped single crystals. 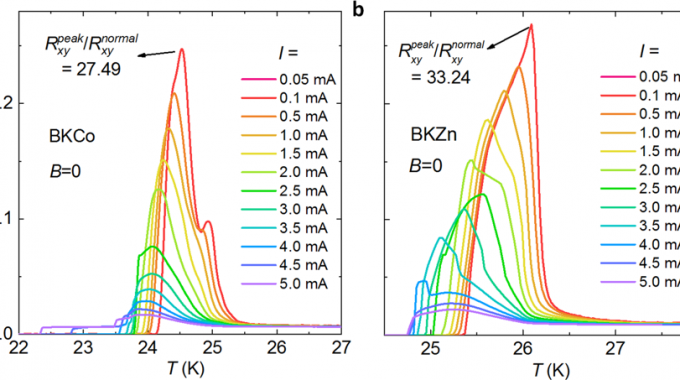 An anomalous transverse resistance was found at temperatures around the superconducting transition, although magnetic order or structure distortion are absent in the optimal doping case. With the substitution of magnetic and nonmagnetic impurities into the superconducting layer, the anomalous transverse resistance phenomenon is dramatically enhanced. We find that anisotropic scattering or the superconducting electronic nematic state related with the superconducting transition may contribute to this phenomenon.